I used to drink orange juice everyday: a big old glass with breakfast. And since I often eat breakfast foods for dinner, I would have some OJ in the evening a lot too. Growing up, I always thought it was healthy. When I got older, I heard that it wasn’t, but I had trouble believing it. Oranges are healthy. Why not orange juice? But then I heard something that changed my mind completely. I wish I could remember where I heard/read this, but a couple of years ago, I learned an interesting fact. It takes about eight oranges to equal a glass of OJ. Maybe six, depending on the size of the oranges and the size of the glass. Either way, you wouldn’t eat that many oranges. I could eat one, maybe two oranges in sitting before I got sick of it. The idea of eating eight oranges makes my stomach churn. Eating eight oranges sounds so filling because it is. Oranges have fiber. Fiber fills you up. And while oranges also have a lot of sugar, that fiber keeps your body from absorbing it all too quickly. Orange juice, on the other hand, has a lot of sugar and not much fiber to show for it. That means it doesn’t fill you up and it delivers a big punch of sugar all at once. As far as your body’s concerned, it’s no different from soda or Kool-Aid. Of course, they do sell orange juice with extra pulp, but a) you’ve still got a half dozen oranges in a glass and b) I usually drank the regular pulp or no pulp anyway. The other myth about orange juice that I used to believe is that it’s minimally processed. You see this in advertisements all the time. All natural! Not from concentrate. 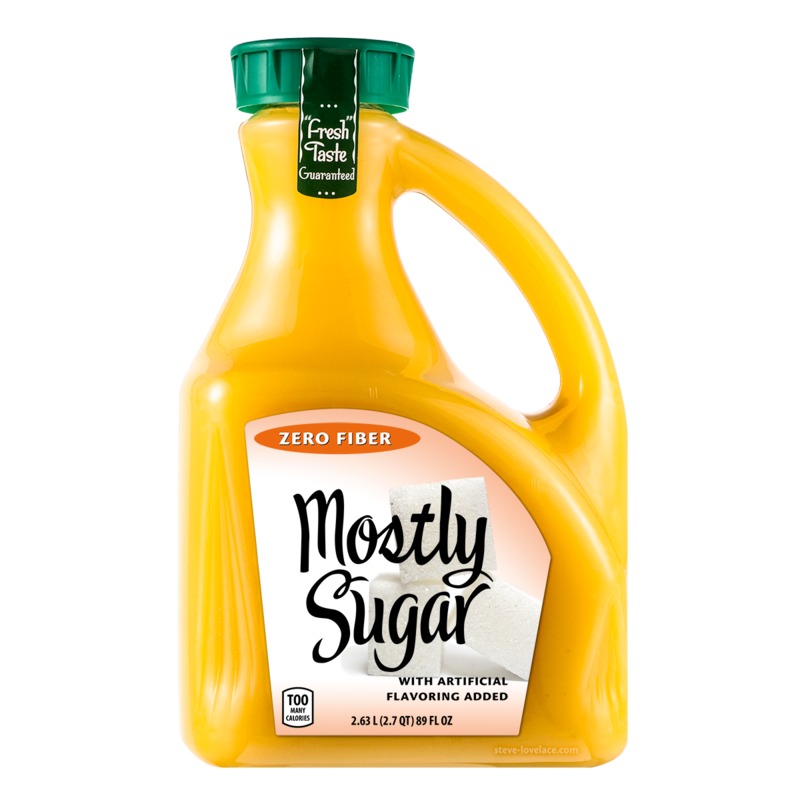 We used to drink frozen concentrated orange juice when I was a kid, but when I got older, I always bought the not-from-concentrate stuff. Then I found out a dirty, dirty secret. OJ, even the not-from-concentrate stuff, has its oxygen (and most of its flavor) removed for long-term storage. Then each orange juice brand adds in its own flavorings for resale. This ensures that Tropicana tastes like Tropicana and Simply Orange tastes like Simply Orange. It also ensures that these brands taste the same year round, whether or not oranges are in season. Minute Maid and Simply Orange are owned by Coca-Cola. Tropicana is owned by Pepsi. Florida’s Natural is the exception. It’s owned by an agricultural cooperative. The fact that most of the major brands come from soda manufacturers should tell you something. These companies specialize in selling sugar water, and they do it quite well. They know that not everyone wants to drink cola, so they market and sell more “natural” kinds of sugary drinks. “Natural” does not mean better though. After all, Socrates died from drinking “all natural” hemlock. Working out at the gym one day, I saw a commercial for some major brand of orange juice. (I forget which one.) It showed a dozen oranges squeezing into an OJ bottle and I thought, “That isn’t a good thing!” The same thing that turned me off of orange juice was being used to show how flavorful their juice was. Of course it’s flavorful! It’s sugar water with flavorings added. Just like Coke. When I first read about how many oranges were in a glass of orange juice, it really resonated with me. I think it’s because you can prove it first-hand. Take an orange and juice it. You’ll get an ounce of juice, maybe two. Take a sip of that juice and compare the flavor to Tropicana. It tastes vastly different from any brand of OJ, whether or frozen or not-from-concentrate. In fact it tastes so different that I didn’t like it very much when I was younger. As sad as this is, I preferred the taste of packaged orange juice, the way a toddler prefers a McDonald’s cheeseburger to a real piece of meat. I didn’t know about the added flavorings back then, but it all makes sense in hindsight. Are you a big orange juice drinker? Whether you are or not, let me know your thoughts in the comment section.